TPC Overall Rank: #323 out of 2933 rides. User Tracker Count: 306 times. I've been on this one several times over the years. It's a classic Schwartzkopf looper that can't really compare to the modern coasters. However, it's worth riding to experience the high forces while going through the old circular loops. The first drop is decent and the loop is cool, but there is really nothing that exciting about this coaster. As far as classic Schwartzkopf coasters go, Mindbender absolutely blows this one away. Still, there is almost never a line for this one and it's a great way to introduce somebody to looping coasters. Also, classic coasters like this are what led to the great technological masterpieces we have today. a solid looping coaster. the drop and loop were very forceful, but the rest of the ride just meandered through the woods which felt more like a train ride than a rollercoaster. Pretty good looping coaster, though it wasnt as great as I had hoped. Hershey has a two train operation on this and I love the lap bar only trains. The first drop had decent zip to it, but there was no air at all during it. As always, the vertical loop was very intense and had strong Gs and following that came a dark tunnel and a few drops, but they were really slow and tame. However, the helix finale was very intense and it had some of the strongest Gs Ive ever experienced in a helix. Its nothing that amazing, but its not a terrible ride. I always have a good time on Schwarzkopf rides. Theyre quick and to the point with an added bonus of inversions with a lap bar. Theyre a dying breed and thats ashame. This is right up there with similar rides like Mindbender. A really bizaare, but fun coaster. Its called Sooperdooperlooper, but only goes upside-down once that I know of. Must be older, cuz there was no harness (a good thing). After the loop, it was a bit anti-climactic, but still a good old-school steel looper. I was really excited to ride my first full-circuit Schwarzkopf, and it didnt disappoint! To start with, the lift began almost immediately when the train left the station, which I like, because it is a no-nonsense type deal and improves waiting time. I mentioned that because a few of the other coasters at Hershey did that and I really dont like all the BS meandering that some coasters do before the ride "begins." Okay, now to the fun stuff: Schwarzkopf loops are officially awesomeness in a jar! Man, there is no other loop I have been on that compares to Schwarzkopf-engineered ones! The upper body freedom is great, due to no shoulder harness, the positive Gs are simply amazing from base to top, and its so darn smooth and enjoyable. The rest of the ride is pretty meh to be truthful. It slows down a lot in the middle, then speeds up after a drop right AFTER a trim break. I could only imagine the speed of that drop without the trim. After that drop, the track goes low to the ground with a lot of speed and very good smoothness. The ride is very fun, but simply has a sleep-educing middle! I cant wait to ride some of Shwarzkopfs other rides like Laser, Shockwave, and Mindbender so I can finally find an untrimmed, classic, double looping masterpiece! 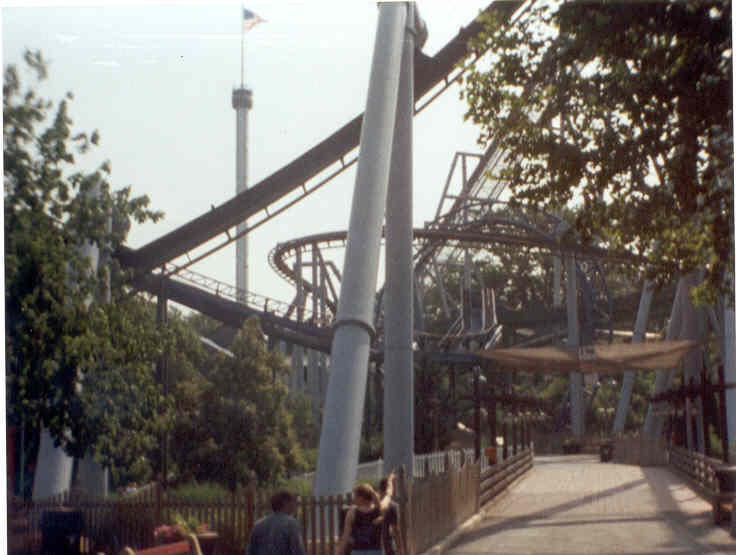 Sooperdooperlooper, however is a very well landscaped and extremely reridable classic coaster. Classic, fun and smooth, which is always nice in a looping coaster. This makes it stay very popular ever since it opened in the 70s.